We have spent all year covering great things from Apple. Now let’s enjoy the end of a great year with a potluck get together. Bring a dish of your favorite liking to share with members. Enjoy an evening of fun and sharing. 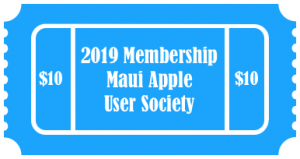 We will have great meeting giveaways including Apple SWAG, and a surprise Apple gadget. You need to be in attendance to be eligible for prizes. We will broadcast a portion of the meeting on join.me when we discuss gift ideas. As always we will save time for your Mac and iOS questions. For directions to our meetings, click here.